Okay, so the hotel website (www.montereybayinn.com) was fixed and I was able to make and confirm my reservations online for my October visit. I can't wait. 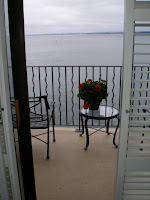 The Monterey Bay Inn is a fantastic hotel located at the end of Cannery Row. 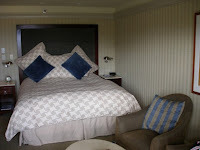 The rooms are comfortably appointed and have great views from either the Ocean View or Bay View sides. Other than my first visit during which I had a Bay View room, I've gotten the Ocean View...and this is what I booked for October. The hotel is located at the beginning of Cannery Row, with the Monterey Bay Aquarium at the other end. The distance is an easy walk with lots of shops and restaurants in between. The Monterey Bay Inn doesn't have a restaurant, but they do have the option of having breakfast delivered to your door each morning. You breakfast choices generally consist of muffins, bagels, yogurt, fresh fruit, juice, coffee, tea, etc. You can also have room service provided by a local restaurant. The room service food is fantastic. I have had room service twice at this hotel and it was some of the best food on my trip. You can also have in room spa services. I have had an in-room massage on two of my trips. Talk about luxury! The great thing about MBI is that it is quiet, conveniently located, well-appointed, has great views, and while a little pricey, is not the most expensive (or even close) option in Monterey. I definitely recommend a visit to the Monterey Bay Inn.